Matthew 7:14, (KJV) "Because strait is the gate, and narrow is the way, which leadeth unto life, and few there be that find it." Think of life as an hourglass. At one end there is an open space that narrows radically toward a very small passage. This space represents our existence outside of Christ. The freedom of wide-open space tempts us to remain. The narrow passage at the center is the spiritual birth canal (John 3:5). It represents the difficulty and personal sacrifice required to pass through into a "new life" (Romans 6:3-4, NIV). Beyond this narrow passage the area reopens quickly. Like the bottom half, it too offers wide-open space that pulls you toward freedom. This side represents freedom in Christ (Galatians 5:1) and is governed by principles of congenial fellowship laid out in Matthew 28:20 and Romans 14. No matter how close you get to the narrow passage, unless you choose to go through you cannot enter the Kingdom of God. All those who discourage entrance through the designated gate are false teachers and must be exposed. The narrow passage is described by Jesus (John 3:5) and Paul (Romans 6:3-4) as baptism. Baptism IS the narrow passage. Baptism IS the very point at which we cross over the threshold and enter into Christ (John 10:9). The wide-open space beyond the gate offers grace and time to grow. It is divinely governed by patience and a benefit of the doubt type fellowship. Only those who fail to grow in the knowledge of Christ are called into judgment on this side of the passage (Matthew 28:20, Romans 14). 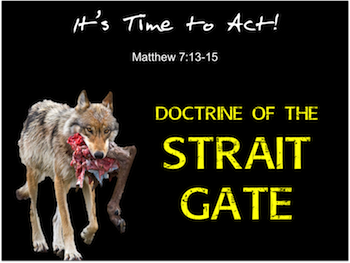 Those who refuse to define the strait gate in biblical terms (essential for entering the kingdom, John 3:5, Romans 6:3-4) create a damnable distraction of false hope within the hearts of those who approach the gate but are told it is unnecessary to go through. These false teachers must be exposed! The word church means those who have been called out of the world. But how does a person know when he has left the world and entered the church. What is the threshold of entrance? Many in Christendom answer this question in a very subjective manner, "It's when I feel Him in my heart. But what if man's heart is not always trustworthy. What if God protects us from our fickle selves by making His plan much more objective? What if He gives us a series of exact qualifiers so that we will not have to doubt the fluctuations of the human heart but can, instead, trust in His specific commands. If there is one thing all humans bring with us at birth it is this, the abilities to recognize our need and cry out for help. It was Divinely placed within us as part of our most basic nature. Study Acts 17:26-27. Over time, the human heart should mature into greater and greater recognition and surrender to the Creator. However, because of the fallen context in which we must develop, maturity comes slow and, often, not at all (Romans 1:18-32). When the Light shines into our darkness (1 John 1:9-13), it takes little more than our infantile nature to see the option (Acts 17:26-27). Unfortunately, our fallen context, the lower half of the hourglass, also competes for attention and it generally wins out (Matthew 7:13-14). The only solution is to listen objectively to the Light. We must respond to our most basic inclination - recognize need and choose to cry out for help (Acts 22:16). From there, the Holy Spirit begins His work. He offers to protect us from our fickle selves through discovery of His objective plan (Scripture). Study John 3:5, Acts 2:38, 2:47 and Romans 6:3-4. The objectivity of the Holy Spirit's plan can be chosen and followed when we employ our most basic nature (Acts 17:26-27)! Legalists who plant themselves just inside the "strait gate" and distract others from freedom by refusing to grow up must also be called out. Church discipline must be administered. "These people are blemishes at your love feasts" (Jude 1:12). Imagine life as a road with deep ditches on either side. The entitlement doctrines of "total," "unconditional," and "irresistible" pull you toward the ditch on one side (Calvinism) and the doctrines of self-worth and graceless precision pull toward the other (legalism). While the cancerous conclusions of Calvinism are damnable, the arrogance of legalism is also lethal. Le·gal·ism (ˈlēɡəˌlizəm/) strict adherence, or the principle of strict adherence, to law or prescription, especially to the letter rather than the spirit. Theology - the doctrine that salvation is gained through good works. Legalism presses human understanding and performance toward a level of self-dependency. The line is moved far beyond the simple acknowledgment of need and the opportunity to accept help (Acts 17:26-27) to a level of self-righteous designators that insert conclusions where the inspired Word remains silent. Legalists create their own laws and justify their actions by inferring a superior approach to Scripture. They assume that conservatism grants them the right to guard Scripture by usurping interpretive authority on God's behalf. The hermeneutic ploy of "necessary inference" is a prime example. Q: Who gets to decide if something is "necessary" or "inferred"? And, if it is so "necessary" why didn't God just avoid all the human tampering by making it into a command? Elevating a biblical example to the same level as a biblical command is another way legalists usurp the authority of Divine doctrine. Q: Who has the right to decide which biblical examples are binding and which examples are not? In Acts 20:7 the early church came together to break bread (probably communion) on the first day of the week (Sunday). A legalist would say that that example is binding. But Acts 2:46 says the early church also met together every day. Why is that example not binding as well? Only the heavenly hermeneutics which are explained in Christ's parting words, - "...teaching them to obey everything I have COMMANDED you," are worthy to govern fellowship once we have passed through the "strait gate." (Matthew 28:20, 7:14) We must bind His commands, learn from biblical examples and resist the arrogance of necessary inference. The doctrine of the "strait gate" demands that we identify and enter through the birth canal (John 3:5, Romans 6:3-4). Those who distract from this commanded entrance are false teachers and must be confronted. The doctrine of the "strait gate" also demands that we use only the commands of Christ to limit fellowship with those who have passed through the birth canal (John 3:5, Romans 6:3-4). Those who refuse to grow up and selfishly distract others from the freedoms in Christ by speaking where God is silent are false teachers and must be confronted. For the spiritual wellbeing of our family and friends it is time to expose the false teachers. It is time to act! Back to Top of "It's Time to Act! 3"